What do u think of Pepe from the new looney tunes show? do u like pepe le pew? de keuze van de fan: YES! HE IS SO AWSOME! Have u heard Pepe's song from The Looney Tunes Show? If so, what did u think of it? de keuze van de fan: Wasnt good. Wasnt bad. Can u tell me the episodes where Pepe Le Pew farts of gets stuck and has to be pulled out? a poll was toegevoegd: do u like pepe le pew? 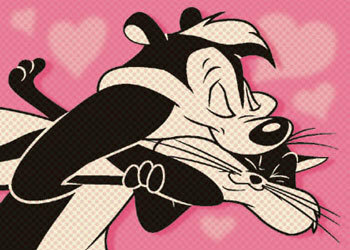 Which cartoon marks the first appearance of Pepe Le Pew? Lourve Come Back to Me!